Mango and Tamarind Snacks bought from a street cart pusher selling fruits in the neighborhood of my aunt’s house. We bought sliced mango and young tamarind, which is the sour type and got three dipping sauces to go with the fruits. One sauce is a simple salt with sugar, chili pepper, MSG, and ground roasted sticky rice. The second type of sauce is made with ginger, chili pepper, sugar, and salt. 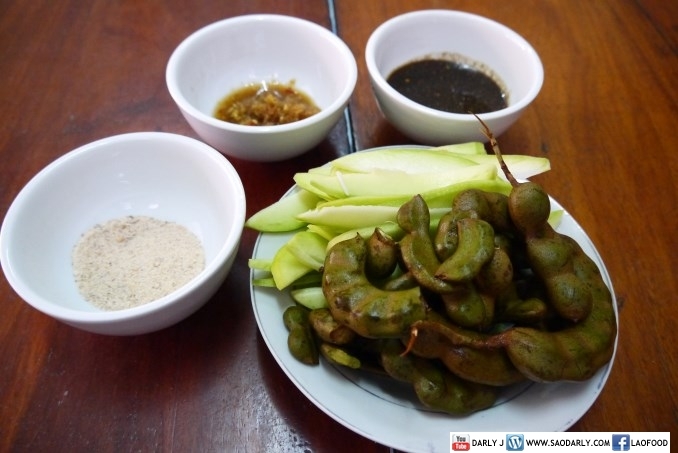 The third sauce is the favorite of everyone in the house and consisted of Padek (fermented fish sauce), sugar, salt, ground roasted sticky rice, chili pepper, and no doubt some MSG.